Full Price: $109 if booking directly through the course. 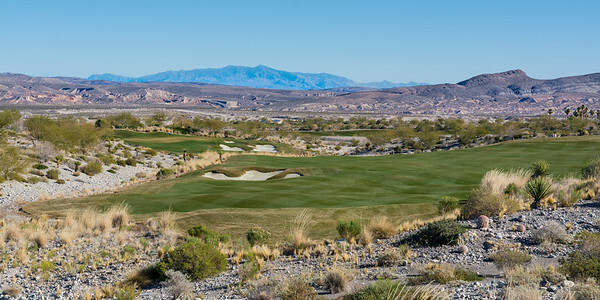 If you’ve come this far to learn a little more about Coyote Springs Golf Club, your first question might be “Where the heck is Coyote Springs?” In a nutshell, it’s in the middle of nowhere about 40 miles north of Las Vegas. There is practically nothing surrounding the course; no town, no housing development, not even a gas station in the general vicinity. The only thing you’ll see is a beautiful golf course. Also of note is the lack of a clubhouse. As of early 2015 there is only a temporary clubhouse. It’s nice enough. There you’ll find hats, balls, shirts, etc. Just don’t go expecting a restaurant, locker room, and other luxuries. As I played the course, I kept wondering why a course like this would be built without anything nearby. Was it meant to be a sort of “if you build it they will come” club ala Sand Hills in Nebraska? Was the intent to eventually build houses and infrastructure around the course? Asking around to club employees there weren’t many answers to be had. There was talk that much of the upcoming development has been held up in litigation, but future plans were up in the air. 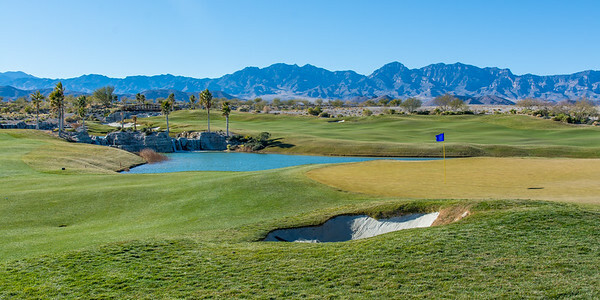 I did a little research to try and figure out at least what the original plan was and I learned (courtesy of Golf Odyssey) that originally Coyote Springs (or specifically The Chase course as it was known) was meant to be the the Western home of the PGA Village similar to what already exists in Port St. Lucie, Florida. Word has it that permission was granted for up to 13(!?!?!) courses to eventually be built. Looking at it now, with one golf course, no clubhouse, and zero housing units, it seems like a pipe dream at best. Then again, I’m sure that 50 years ago if you had looked at most of Florida and tried to envision what it’s become today it would be impossible. Reading all this one might think that Coyote Springs is a bit lacking in its amenities or maybe it’s a no-frills operation. Nothing could be further from the truth. 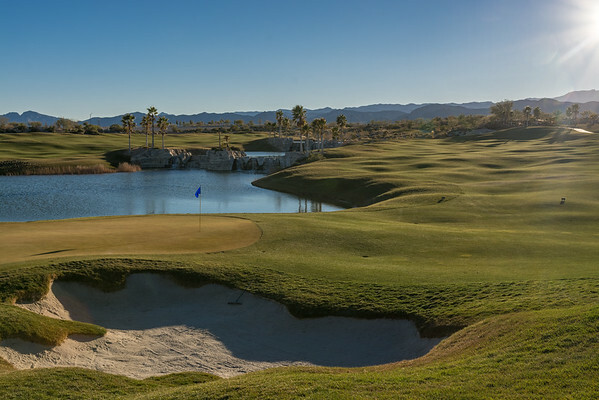 If you’ve come to play golf (and have the requisite game), you’ve come to the right place. The practice range is world-class. There are more target greens than I could count. It spreads 180 degrees so one can play with any wind direction they choose. The short game area is also superb. 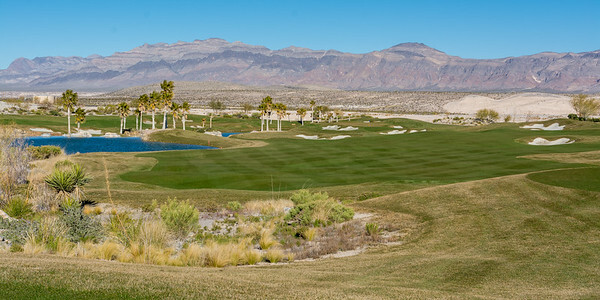 If one could level a complaint about Coyote Springs it probably would be the course playability. Many golf courses get criticized because they are too difficult. There are too many hazards. The greens are too severe. There is a school of thought that all of these new black diamond-level difficulty courses are killing the game due to countless hazards, the subsequent 6 hour rounds, and bloated maintenance budgets. 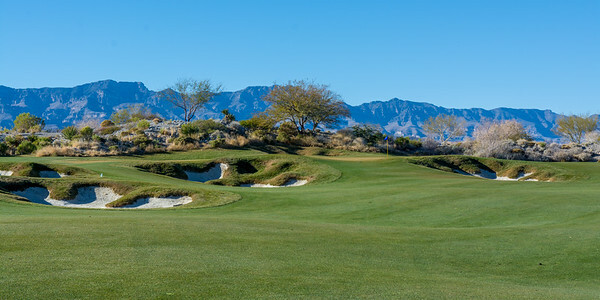 Make no mistake about it, Coyote Springs is an extremely difficult and unforgiving golf course. 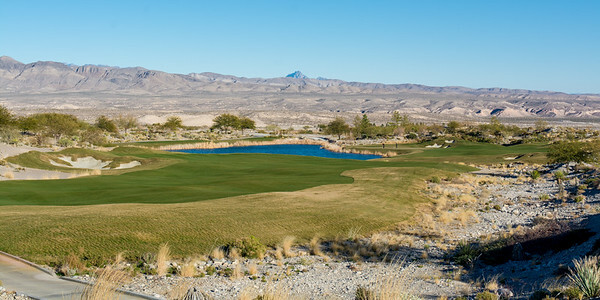 Probably the most extreme part of Coyote Springs are the green complexes. Not only are the greens extremely fast but the severe undulations make them close to impossible if you end up on the wrong side of the hole. The way the course is set up, many of the bailout areas are spots where it’s all but impossible to get up and down. The 12th hole provides the perfect example of this. It’s a relatively short par 3 of 164 yards from the blue tees but miss it short and you find yourself in a crater-like bunker. Miss it left in the collection area (or long in the rough) and you find yourself chipping to a flag running away on greens running at 12+ on the stimpmeter. This is not to say that a challenging golf course is a poor golf course. It’s just to say that most players will struggle coming here. I am about a 8 handicap, and I shot a 92. The combination of fast greens and high winds meant that downhill, downwind putts had a hard time staying on the greens at all. 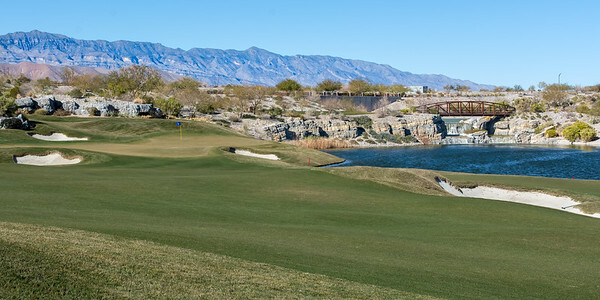 As I told a friend of mine, Coyote Springs reminds me a lot of Old Corkscrew in Estero, Florida. Some will love it; some will hate it, and just about everyone will have a strong opinion about it. The best thing about Coyote Springs is probably the conditioning. Everything is superb. The greens are like putting on a pool table, both in speed and smoothness. The fairways are mowed so tightly that it’s challenging to pick blades of grass to test the wind. The waterfalls (man-made of course) are beautiful. The rough is thick, lush, but not unplayable. As mentioned earlier, the practice range is also superb. So if you’re in Las Vegas is it worth it to make the 45-minute drive to Coyote Springs? If you want a solid test and aren’t worse than about a bogey golfer then by all means. I’m not sure you’ll find better value anywhere close to the Strip. 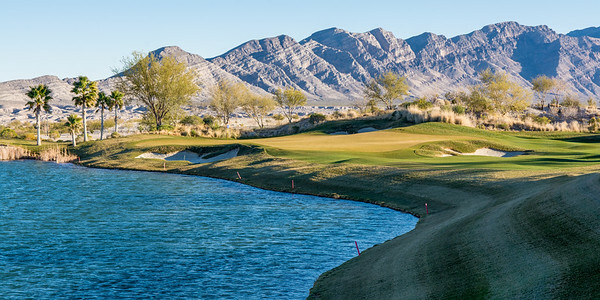 If you are a twice a year player who shoots 100+ on your home course, just know what you’re in for at Coyote Springs. Come and enjoy the scenery but leave your expectations behind. Coyote Springs is not the track to shake the rust off or build confidence. If you like the photographs from this post and would like to see full-size versions click here to go to my photography website.